Since 1997, the internet's most compressive reference and database on the topic! There is no lack of news for this month! First, I, and several long time PacificWrecks collaborators will be attending two WWII related events this May. I am always eager to meet more of you in person, and talk Pacific history. There are two upcoming events of interest: The P-38 National Convention, and spectacular "Planes of Fame" Air Show at Chino Airport. Pacific Wrecks / Pacific Ghosts will have a booth at the flight line. If you are in the area, be sure to join us at that event, and stop by our booth, on the flight line to say 'hi'. It will be a chance to meet more of you person, look at warbirds, and talk history. The museum's authentic A6M5 will be in the air, as well as their P-38 and many other amazing aircraft. With dozens of veterans and special guests in attendance, the air show is the must-see event of the year for sure! I will also plan on attending the new WWII memorial opening in DC. To pay tribute to this effort and the veterans present, then see the new Udvar-Hazy Air & Space Museum afterwards. 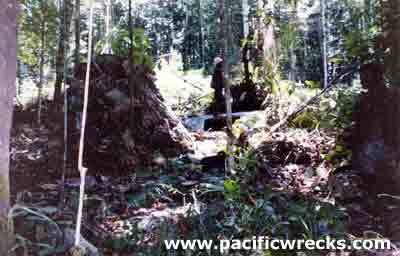 If you are interested in contributing to the pacificwrecks website, visit the submission center. Looking forward to seeing you in person or on email. May 12-16th The P-38 National Association is sponsoring the P-38 National Convention at Ontario, CA May 12 - 16. Based at Riverside, along with the 475th FG Museum, the convention will include many Lightning veterans in attendance, plus speakers including David Mason who rediscovered the crash site of Major Thomas McGuire on Negros Island in the Philippines, and conclude with the Planes of Fame air show on Saturday, May 15. See photos of the P-38 Fly-In at Burbank Airport. last week. Chino, California May 15-16th Join us at the 2004 Planes of Fame Air Show! PacificWrecks / PacificGhosts will have a booth at the flight line. See photos from last year's event. Joining us again will be Bruce Fenstermaker describing his MIA research, and author Gary Nila, with his Japanese aviation flight gear display. Also, historian Phil Bradley from Australia will be joining us, and Adam & Bryan Makos from Ghost Wings Magazine. Present at the show will be two special veterans groups: veterans who flew the P-38, and the Unabara-Kai (Japanese Surviving Naval Aviators Association). In the air will be all the Planes of Fame Museum's aircraft, including the A6M5 Zero, several P-38s, fighters, bombers and the spectacular climax of all the warbirds in the air together. This event is not to be missed! For full details and directions, see the Planes of Fame Museum webpage. Washington, DC May 27th The National World War II Memorial is being open to the public. Visitors will see construction workers completing minor work in areas outside but adjacent to the Memorial. The Memorial is a tribute to the World War II generation. The Official Dedication Ceremony will happen Saturday May 29. Pacific Wrecks will plan on attending the event, anyone looking to link up at the dedication, and look forward to meeting any Pacific veterans in attendance, email us if you are attending. In an earlier Pacific Wrecks update Daniel Leahy presented this haunting series of photos of the crash of B-25 over Hansa Bay. Thur the power of the internet, several veteran eyewitnesses to the crash added their comments. Last November, John Douglas and I traveled to the exact location of the crash, to take 'then & now' photos, and to pay tribute to this 3rd BG loss, B-25D 41-30345.
by John Douglas. 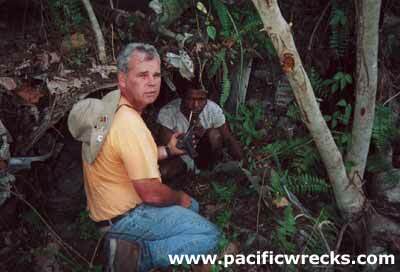 Monthly column on wreck related activities and discoveries in Papua New Guinea. 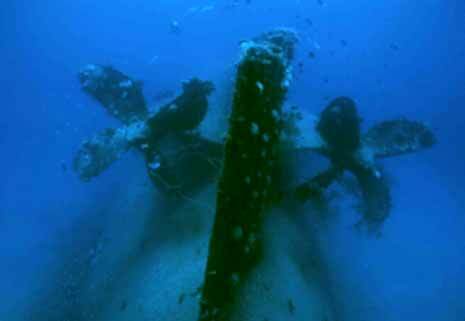 Learn about the conclusion of the JPAC (formally known as CILHI) MIA recovery of B-24D 42-40475 and new wreck sites he is investigating. Also, the discovery of a pre-war Fairchild Model 91 in Port Moresby's Fairfax Harbor. by Alfred Weinzierl. Comparatively little about the Japanese side of WWII is ever translated to english. This new section works to provide history, translations and photos that have never appeared in english for the first time. Presented are two research pieces: The Lost Squadron of Tonys and Ki-21 Sally Attack Munda and Rendova. Also, new photos from Japanese collections of the occupation of Kavieng and a ditched Betty. We hope to bring you more in future updates. Mystery of the "Mascot Dolls"
by Ellen Schattschneider. Small figures known as “mascot dolls”(masukotto ningyo) or “keepsake dolls” (imon ningyo) during the Asia-Pacific war. Many thousands of these dolls were made by women in Japan, and given to servicemen in the Imperial Japanese Army and Imperial Japanese Navy. 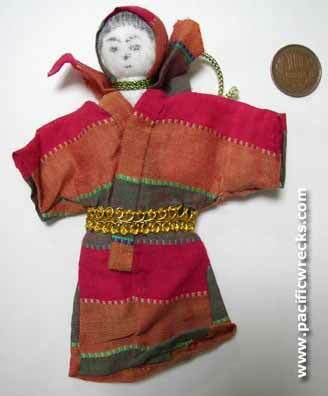 Initially, these small cloth dolls, nearly always depicting a female figure, were sent to soldiers serving in China. They became especially popular during 1944-45, when many tokkotai (“kamikaze”) carried the dolls on their final missions. (USA) Those with the History Channel, tune in for "Deep Sea Detectives" dedicated to the USS Mississinewa (AO-59) story. The program will air at 8PM in most areas. Video footage of the wreck of the USS Mississinewa was provided by Rick von Stein. Interviews with Sid Harris, Bill Ruwell SK1c, Milford Romanoff Lt. j.g. (USS Lackawanna AO-40), Chip Lambert, AO-59 book editor Jim Delgado, Ens. Frank Canavan, John Mair F2c, and Mike Mair will be included. Navy personal and Ron Worthington from GPC are also included regarding the February 2003 de-fueling ops. Thanks to Mike Mair for this update. 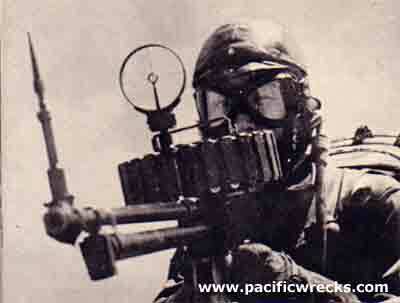 View all WWII Pacific Book, Magazine and Video Reviews a comprehensive source for all the best Pacific related references and reading. Have a book related to WWII Pacific to recommend? Write a review and add it to the archive. What Pacific WWII Books Are You Reading? Submit your review of Pacific WWII related books, videos or other publications. anything, new or an old from your bookshelf. All reviews are credited. Website devoted to the book by Don Allen, and resource center for veteran interviews from the battle. Links, news and coverage of the 60th anniversary events on Tarawa. Sweetheart Reads Downed Pilot's Memoirs for First Time. Thanks to Dan McAnarney for this link. Ace of VMF-214 in WWII & Korea pilot profile and experts from service in the Solomons. Article about the Solomon Islands today, and interview with John Innes about WWII history. Donations, Submissions and New Information help the site to grow.